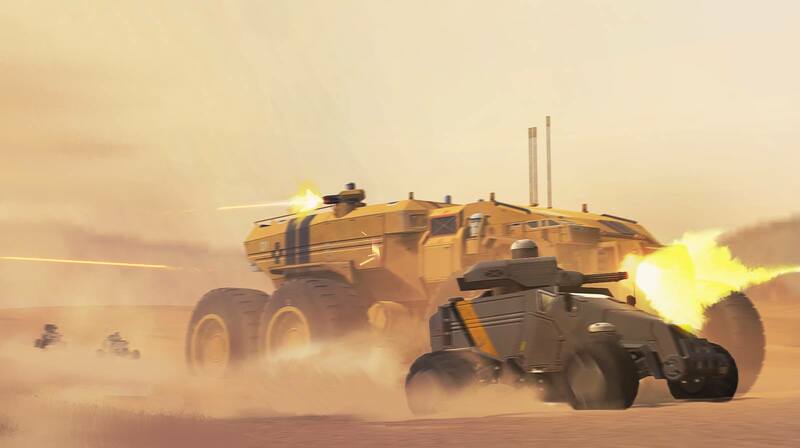 I’ve recently just finished Homeworld: Deserts Of Kharak, and one thing is for sure, it is most certainly a Homeworld game. 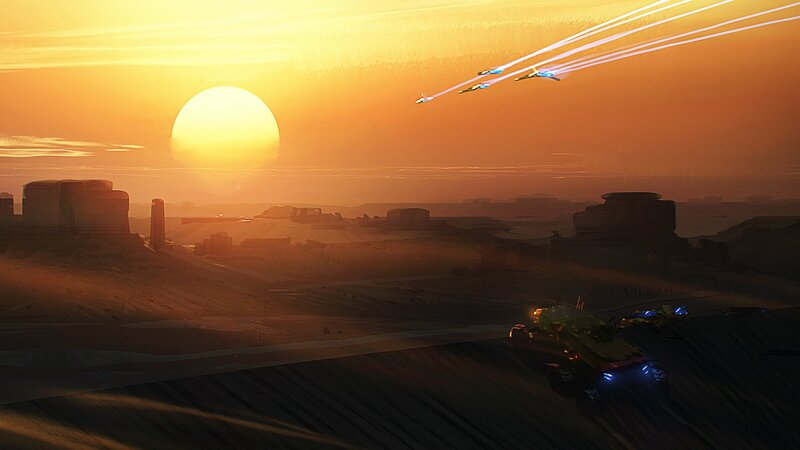 After watching the ending cut scene play and seeing the credits roll up, it took some thinking whilst looking at the concept art overlaid with names that I started realizing how far homeworld has come, and just how Art and Story driven it really is. The narrative drives everything in Homeworld, The music, the art, the level design, the voice acting, everything. So lets take a look at how this franchise has evolved in terms of its design philosophy of the units and ships of the Kushan from game to game. Whether it’s the vastness of The Great Banded Desert, or the emptiness of the Sarum Space Sector. The kushan have time and time proven themselves nothing if not adaptive. 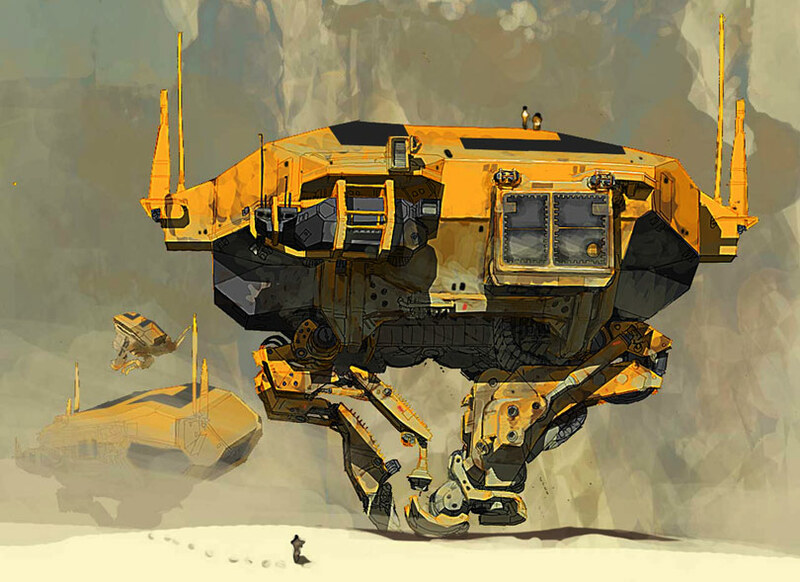 Lets start with Ship Breakers/Deserts Of Kharak, hence it’s the first game canon wise. First glimpse of the vehicles going from light craft to capital craft, It is somewhat interesting on how they where conceptualized. 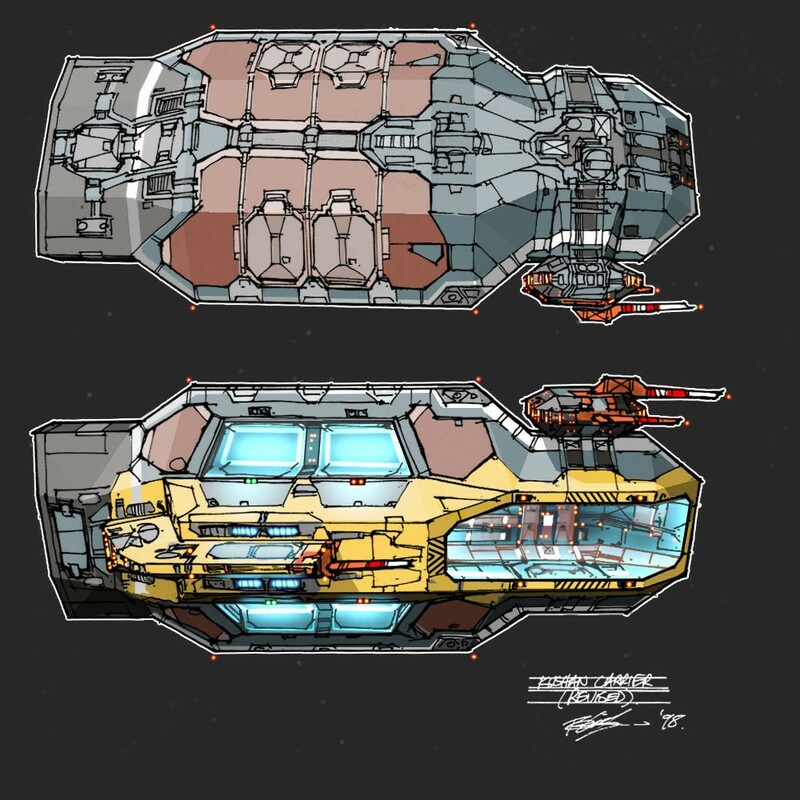 The bright yellow color scheme give a somewhat utilitarian and rugged, almost “construction craft” look to them, were as in the original homeworld and homeworld 2, yellow was mostly only used as accent colors signifying drop-off points on a capital ship or uniform for strictly utilitarian units such as resource collectors and mobile refineries. It may be as this is just a faction color scheme for the Kapisi, (hence the Sakala was dull blue with white stripes and accents) but it is nonetheless an interesting color choice. 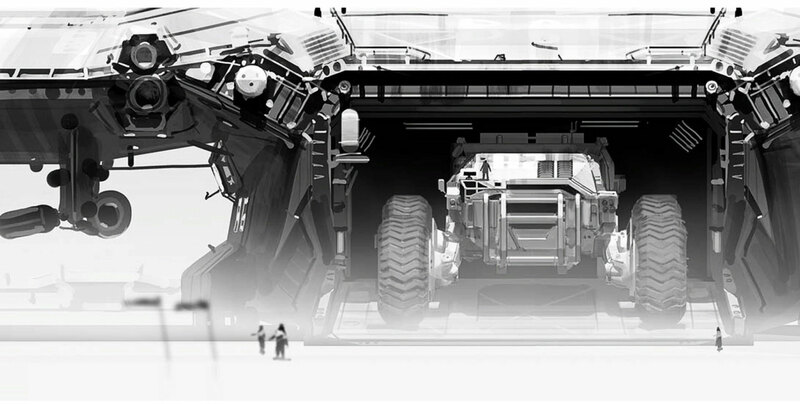 Of course, as being a Homeworld title, all vehicles, even the smallest, LAV’s, are still absolutely massive. Small details such as large antennas, industrial beams, radomes, signal towers, small mechanical openings and lights really ground out the scale of the vehicles in comparison with each other, and its kind of this weird but neat “toy truck” effect where smaller vehicles go into bigger vehicles, and bigger vehicles go into even bigger vehicles. Overall it’s interesting how even from the Ship Breakers period, to Deserts Of Kharak that Units are made to match the setting and terrain. 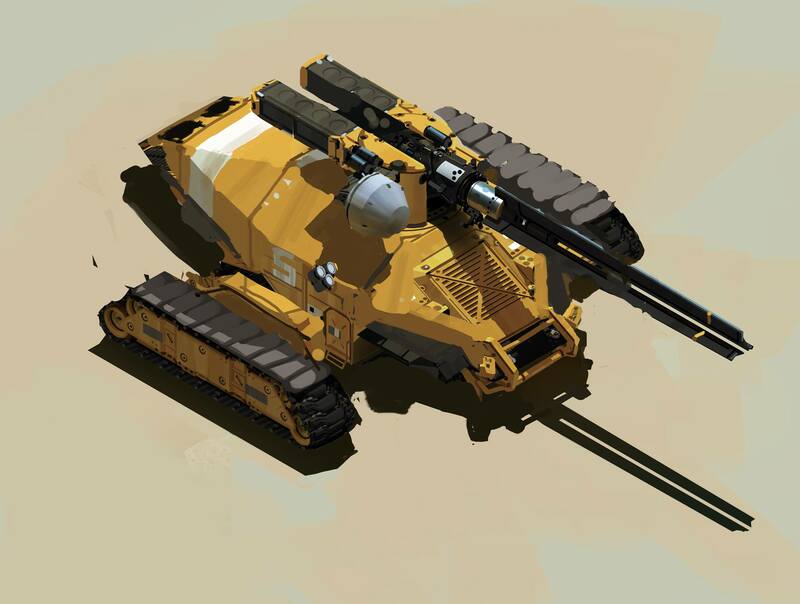 There are not just tanks for the sake of having tanks, not just attack buggies and such just to have them, There is rhyme and reason on how each unit operates, its own unique abilities, and how it even interacts with terrain which just shows why Translating that not only in gameplay, but on the design and look of the units was so important for Deserts Of Kharak. Moving onto Homeworld we can see a huge leap, obviously in technology, but in the structure of how these vehicles look and operate. 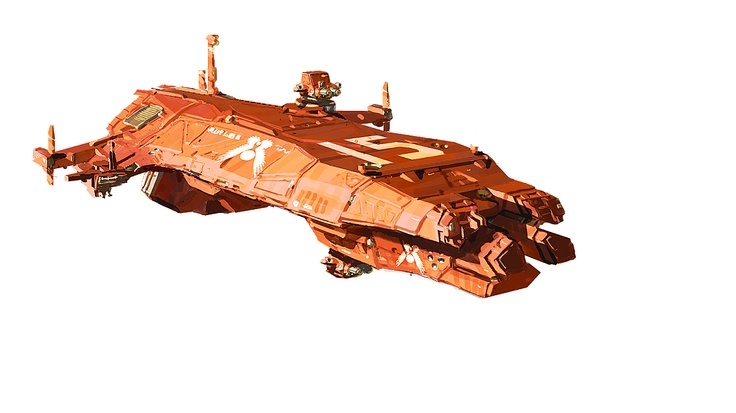 Aside from a completely new color scheme, and a larger variety of each classification of unit, a lot of that “utilitarian” look can really be pinpointed to the Kushan ships from Homeworld. 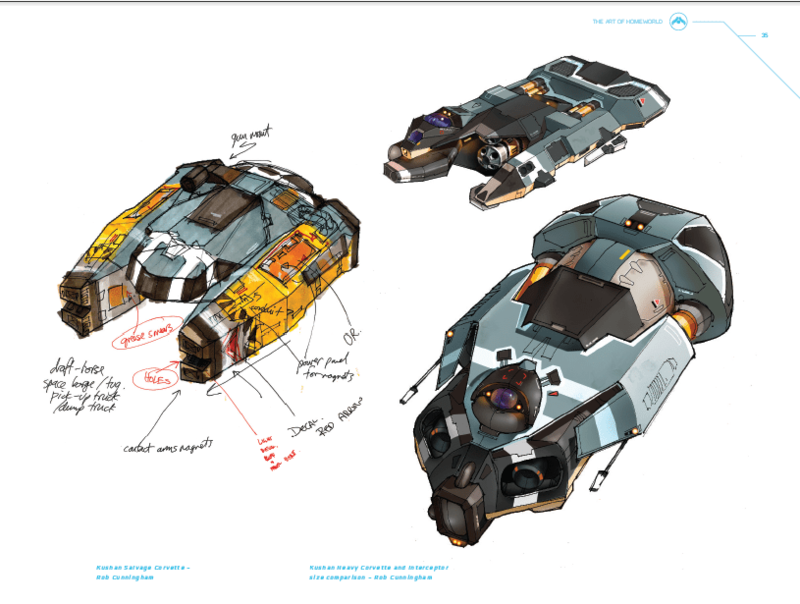 Each individual unit had a very distinct profile and kept visual queues on what the purpose of each ship was. Example would be the Kushan Salvage Corvette, mostly used for artifact and ship recovery. On the sides you can see large pod like structures painted in yellow (like stated before, had that “construction craft” look) with the emergency stripes at the end strutting two outward points of where the magnets make contact. It’s a very subtle and neat way that really shows each unit has purpose and design in this world. Strike craft, frigates, and even some capital class vessels essentially keeps the same chassis, with interchangeable attachments and such, which pulls out more of that some what space travel “virginity” that the Kushan have, (hence the game taking place in their first interstellar space expedition.) whom have to, in a sense, make do with what they have. Its also interesting to note that in the game, most of the new units you can build and research, requires you to capture and reverse engineer captured enemy units such as Frigates, Destroyers, Emplacements, and so forth. In Homeworld 2 we can see the Kushan/Hiigaran really have a more uniformed and much more sleek, militaristic look to them. 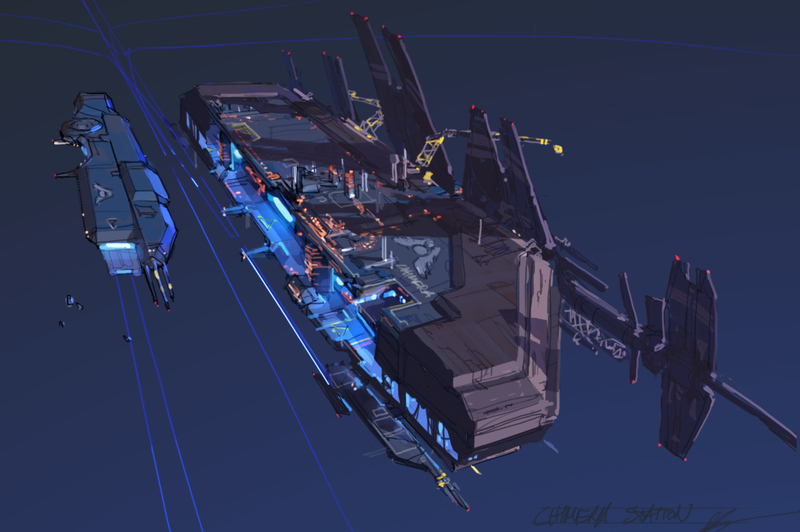 The design and structures of the ships have been much more ground out and more realized. Strike craft no longer carry that Interchangeable Chassis design from the Previous Homeworld, Which interestingly enough, a lot of that was switched over to the Vaygr, so much so where as research options for building new ships require you only to research the chassis of the ship rather then each individual one like the Hiigarans. Most ships now have a very flat and streamlined profile, (aside from the iconic mother ship that is,) and have a very “naval ship” tone to them. Carriers and shipyards now have a flat surfaced landing pad like look to them, with tight crunchy details showing where certain modules, and even docking ports, are placed and you can see where each class of ship can dock to individually aside from one large docking bay. Also Utility class vessels have kept the Yellow striped color scheme as seen before. A lot of real life vehicles and air/naval craft were used as inspiration and things such as wings, and aerodynamic like aspects suddenly came into the Hiigaran Outfit, Which was quite a departure from the blocky, structure heavy Kushan Ships from Homeworld, but not so much to be a completely different thing in total, and even then there are a lot of aspects that stayed from Kushan to Hiigaran such as antennae stripes, a few color schemes, and panel structures. In general its pretty neat to look back and see how the units and look of the Kushan/Hiigaran has evolved in such a way were each iteration was completely different, but only in a way where it refined itself over time. 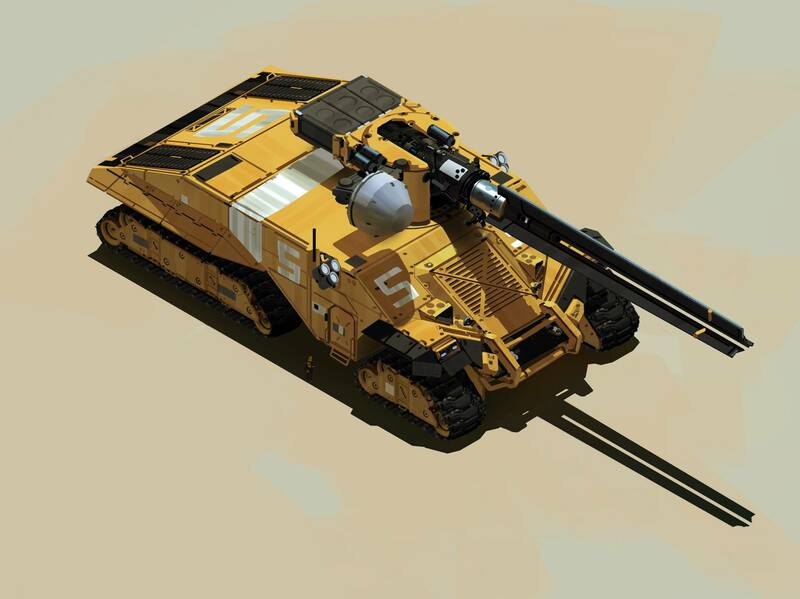 Of course in one of these, the purpose of these units was totally different for obvious reasons, (you know, desert world, ground combat, etc…) but still kept the staples of any Homeworld game. Julian Schlottmann is a creative type hailing from the mythical lands of Atlanta Georgia, and is forever dedicated in his quest to achieve fame in glory through his exploits of art, game, graphic, and media design.